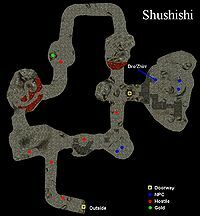 Shushishi is a bandit cave over the hills to the east of Caldera. 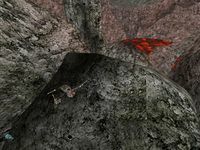 It is difficult, but not impossible, to climb the hills without levitation; however, without levitation you will need to travel a long way to get back to Caldera - all the way north to Ald'ruhn and back. 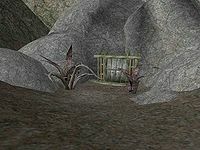 Shushishi is a fairly standard bandit cave, with four slaves: two in a locked compound, and two further at the bottom of a cave guarded by the bandit leader himself, Dro'Zhirr - one of the few Khajiit who seems to have no compunction about enslaving his own species, although the two he keeps with him are both Argonian. 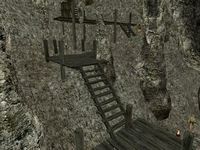 There is an extra section, for which you will need either levitation magic or high acrobatic skill to reach, with some nice bits of treasure for the finding. Dro'Zhirr himself carries some expensive jewels belonging to Aeta Wave-Breaker, a Nordic woman who can be found wandering around outside Caldera's walls - indeed, she may have sent you on a quest to find them. This page was last modified on 8 September 2018, at 04:08.